Gruber was an Obamacare architect who helped draft the law. This is a fact regardless of whether it's currently convenient for the Left. Jonathan Gruber was a key architect of Obamacare who was intimately involved in the drafting of the legislation. That is a fact. It is not arguable. It is not assailable. It is backed up by overwhelming contemporaneous evidence long before Gruber became a controversial figure whose loose lips threatened to sink the Obamacare ship. And the people who pimped Gruber as the all-knowing health care savior who single-handedly built the model that guaranteed a future of health care glory were not Obamacare’s critics. They were its most ardent proponents. Gruber’s numerous video-taped remarks have caused enormous problems for the pro-Obamacare left. Enormous. And the problems are directly related to the lawsuits challenging the validity of an Internal Revenue Service (IRS) rule that says patients in states without state health care exchanges are eligible to receive federal subsidies to offset the obscene costs of their health insurance plans. The text of the Affordable Care Act repeatedly states that federal subsidies may only flow to those who purchase their plans from an exchange “established by the State” as opposed to one established by the federal government. Unfortunately for the Obama administration, states weren’t all that keen on the whole state exchange idea. So most of them balked. And when it became clear that states would not do Obama’s dirty work in establishing their own exchanges, the IRS came to the rescue and promulgated a rule stating that federal subsidies would be available to everyone. Without the facade of federal subsidies to help mask the massive cost increases caused by Obamacare, the already rickety law collapses. And the best part about the whole legal controversy over the IRS rule is that the self-styled brightest minds of the leftist online commentariat never saw it coming. As I wrote back in July, if nothing else, the whole Halbig hullabaloo just goes to show how bad most leftist wonks are at their jobs. The latest uproar over Gruber proves it once again. Now, to their credit, they seem to finally understand how bad Gruber’s comments are for the pending Supreme Court case about the IRS rule. And his comments are damaging because they fly in the face of the government’s arguments about the absurdity of believing that the law meant to prevent subsidies from flowing through federal exchanges. But in one of his many videos, Gruber clearly states that what the government says is absurd is actually the precise outcome intended by those who designed the law: the federal government wanted all 50 states to establish exchanges. What better way to coerce them into doing that than by making federal subsidies contingent upon the establishment of a state exchange? What the Obama administration’s legal briefs say is absurd is exactly what the law’s architect said was the end goal. So it's true Gruber designed Obamacare conceptually, also true he played no direct role in writing the law. I can never quite tell if Chait himself is dumb as paste, or if he merely assumes that his readership is dumb as paste, which would just make him one of the Internet’s most intellectually deceitful writers, rather than one of its dumbest. Maybe it’s both. Who knows. I’ll leave that to the discerning reader to decide. The language used in the story is fascinating, since it basically characterizes Gruber as the property of the White House. How else could the White House lend him to Capitol Hill unless it owned him outright? Now enter Jonathan Cohn of TNR. Cohn has long been a direct conduit for Obamacare spin from Gruber. As a result, Cohn pitches himself as a true expert on Obamacare, one of the few people who followed every zig and zag of the law as it moved through the legislative process. He then uses this authority-by-osmosis to bash the notion that Obamacare prohibits federal subsidies from flowing through federal exchanges. And how does Cohn describe Gruber? Why, as Obamacare’s architect. Over and over and over again. 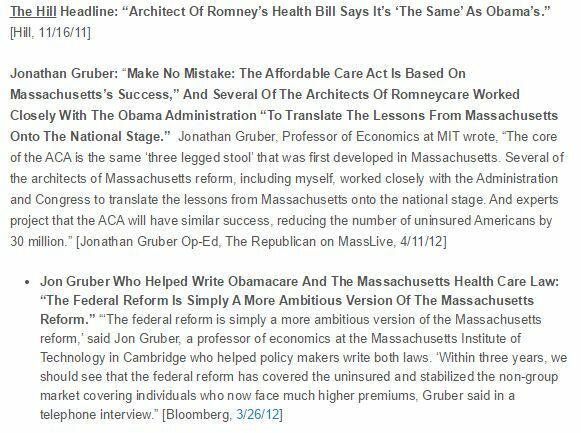 It’s almost as if Cohn had a keyboard macro specifically designed to refer to MIT economist Jonathan Gruber as Obamacare’s architect. Let’s take a look back at a few of the different ways Cohn described Gruber before the Halbig/King/Burwell unpleasantness began. MIT economist Jonathan Gruber, one of the plan’s architects, led a group of center-left intellectuals who hyped the experiment’s success and touted it as a model for national action in articles, speeches, and consultation with prominent Democratic Party politicians. On October 11, 2011, Cohn included Gruber in a story with the sub-headline “A timely reminder of just how closely the architects of Obamacare modeled their efforts on Romneycare.” Cohn asserted Gruber’s authority as the architect of Obamacare and Romneycare in order to bash Republican presidential candidate Mitt Romney. Care to guess how Romney’s team addressed the controversy? By saying Gruber wasn’t really all that involved in Romneycare. Sound familiar? For many people, the Patient CARE Act really would mean cheaper insurance, just like the proposal’s champions say. But that’s because there’d be less security. “It doesn’t work if you’re poor or if you’re sick—other than that, it’s ok,” quips Jonathan Gruber, the MIT economist and Obamacare architect. Let’s start with the question of whether Gruber was, as he himself sometimes says, an “architect” of Obamacare. He was, but not in the sense that most people are using the word. That is some straight-up amazing historical revisionism right there. First off, note how Cohn passively lets himself off the hook for his own fawning descriptions of Gruber. Who referred to Gruber as an “architect of Obamacare?” Gruber did. Silly Gruber. And is the use of the word “architect” important? Well, yes, kind of, but only if you understand what the word architect really means. UPDATE: Jonathan Chait has responded to my piece here. It is about as convincing as this treatise on why fire can’t melt steel. In other words: vintage Chait. As Peter Suderman at Reason notes, Gruber himself acknowledged in a 2012 presentation that he literally wrote, at a bare minimum, the portion of the law containing small business tax credits. And then you have Sen. Max Baucus, the chairman of the ultra-powerful Senate Finance Committee, state on the Senate floor that Gruber made CBO’s scoring model for the bill possible. The reason that so many people — especially those who desperately wanted Obamacare to become law — referred to Gruber as the law’s architect is because he helped design, build, and perfect it from the ground up. The notion, supported by all evidence, that Gruber built the scoring model *and* told lawmakers how to draft to satisfy it escapes Chait. @seanmdav wondering how Chait is going to explain how Gruber was both at the White House 19 times & never left Cambridge. Ought to be good!